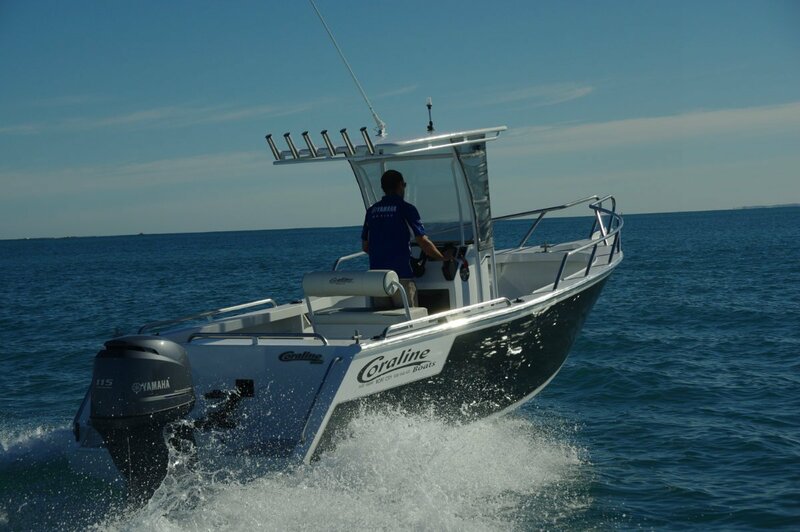 The aluminium Coraline 550 SF has a feature I cannot recall seeing on another centre console: side and front clears instead of a windscreen; brilliantly simple and giving much better protection than the average boat of this style. Coraline made a meal of the job while they were working on the console. As wide as it could be without interference to easy foot passage all round, it has good storage capacity with a locker and shelf above, and mounts a massively strong pipe framework to carry the hardtop. The strength has uses for more than eliminating all traces of shake from the roof. Under slung grab rails run along each side, exactly where passengers like to stand and strap hang like train passengers. 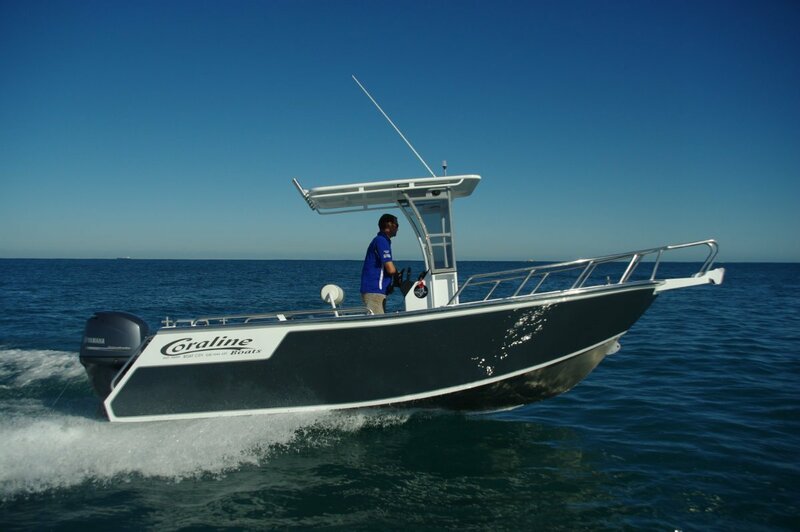 Largely open boats like the Coraline need plenty of hand holds, and the 550 has them. The cockpit aft of the console has coaming grab rails down the sides and across the transom. Forward there are raised side and bow rails, and in between the vertical supports give a further choice. Not that standing is a necessity: A removable lounge fits into sockets at the transom, and the driver and a necessarily close friend share a reversible seat. More comfortable than most examples of the kind it sits on a usefully large storage box. 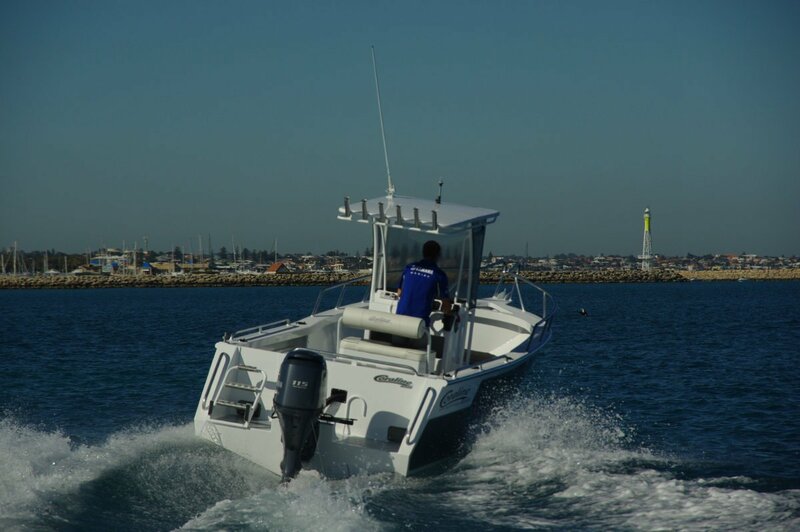 Centre consoles are the quintessential fishing boats, with their prime attribute being access to the boat’s entire perimeter. Coraline made the decks alongside the console wide enough for easy fishing rather than just for squeezing through. The deck forward is a step up from the side deck, making both a casting platform and an extra storage space beneath. Centre consoles are generally light on for places put things; this one, also with transom lockers and side pockets, has abundance. 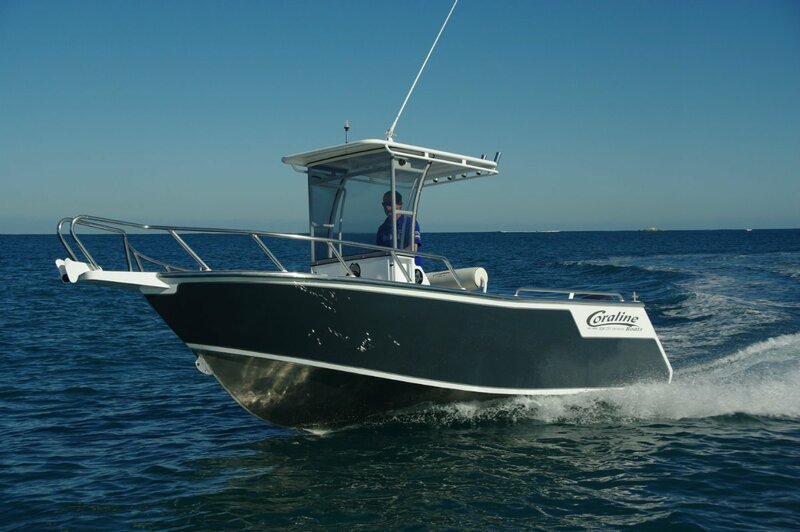 Fishing goodies include a drop-in bait board, a battery of rocket launchers and a deck wash powered by the boat’s forward motion. The whole deck is carpeted for the barefoot angler, with a press stud section covering the lid to the self-flooding kill tank. The self draining deck has freeing ports big enough to get water off it in a hurry – not that any came aboard on the review day. Our boat was powered by a 115hp Yamaha four-stroke, the biggest motor the builder recommends. Top speed was 35 knots, meaning that low-twenties cruising was a relaxed and quiet speed. 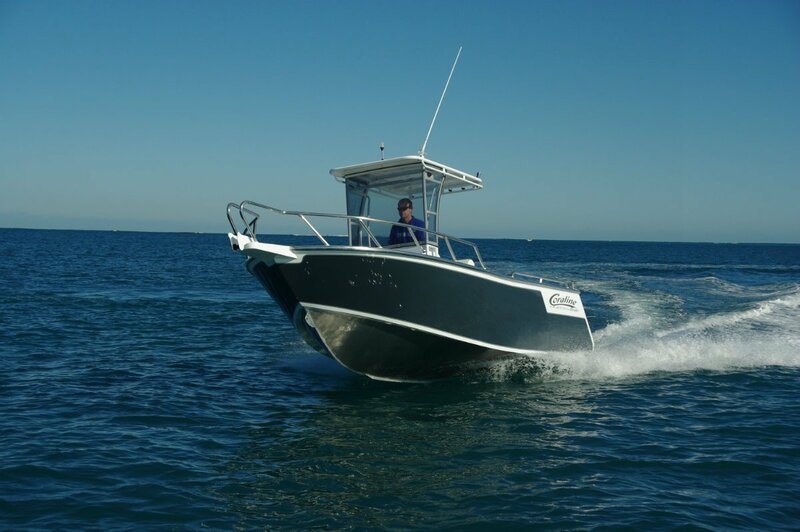 The quietness extended to the hull – no oil drum-type noises, which is what you would expect from a boat in 4mm plate throughout and with heavy duty underwear. The ride is good, which is true of all Coralines I have driven in recent times. The designs are constantly evolving, the bottoms becoming sharper and the chines wider. 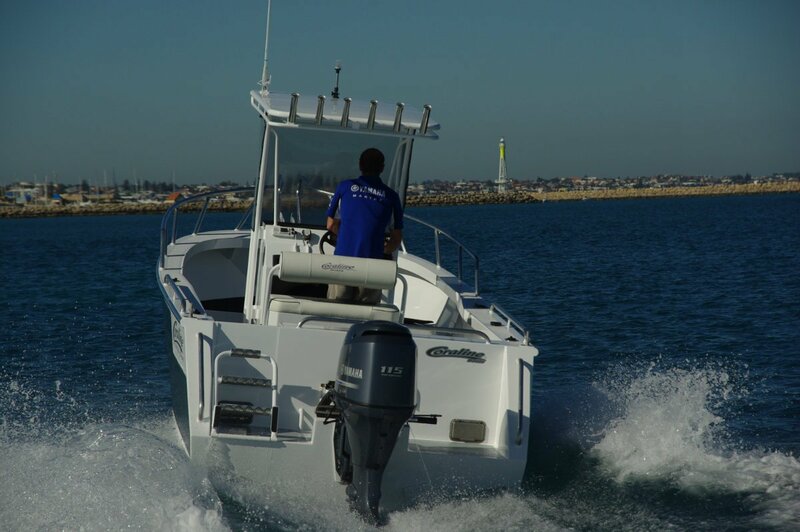 Far from making the 550 a twitchier boat, the reshaping has resulted in a particularly stable platform – a valuable attribute in a boat that encourages clustering up to the rail. Getting windblown is optional instead of the usual compulsory centre console experience. For balmy summer days by all means unclip the clears, but I was glad of them on the coolish test day. All of the driving experience was good; seat, wheel and controls were on good terms with each other, standing worked as well as sitting did, and the hydraulic steering made wheel turning literally a fingertip job. Retrieval time made me grateful for how trailers have improved as my muscle power has decreased. The 550 came standard on a multi-roller tandem trailer with mechanical discs and a synthetic fibre winch rope. One continuous wind in top gear did the trick with no heavy breathing. A bad experience at this part of the day could have knocked the edge off the whole experience.